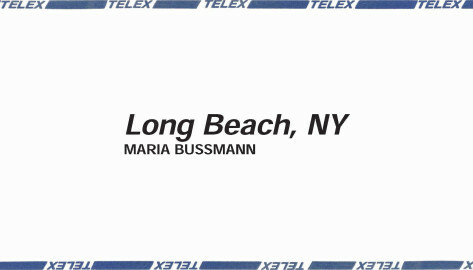 A journey in drawing, a journey in thought, a journey of a different kind: Maria Bussmann invites visitors to the exhibition Long Beach, NY in the Secession’s Grafisches Kabinett to take a walk along the beach. 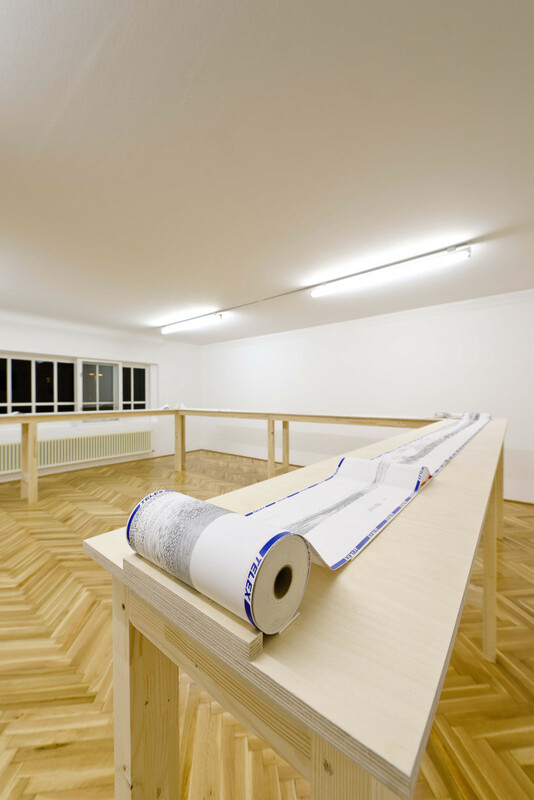 On 20 metres from a continuous roll of carbonless telex paper, she sends a graphic greeting from New York to Vienna and transports viewers into her personal cosmos of memory and imagination. For Long Beach, NY Maria Bussmann switches philosophy for drawing as the basis for her drawings, dealing with a stay of several weeks in Long Beach, New York, a city that has become her second home alongside Vienna. 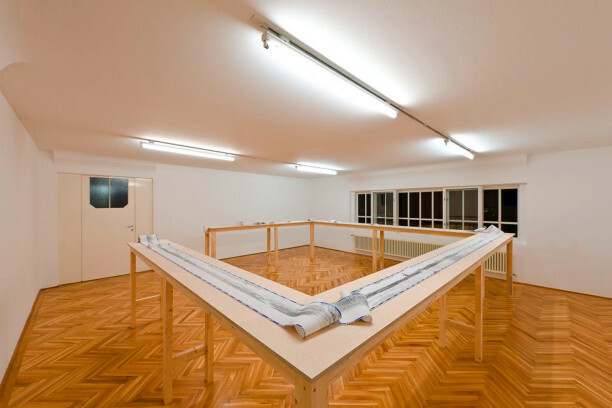 In accordance with the method of automatic writing, the artist generates a continuous stream of beach, sea and sky scenarios. “The formula is: water and sand, sand and water—in innumerable variations, theoretically infinite, just like the roll of paper and its impression,” the artist says of her drawing: “Although this time the work is not linked to a philosophical text, it is a work of ideas that transports concepts, wishes and thoughts—a private meditation, so to speak”. In the work on show in the Grafisches Kabinett, the artist resembles someone lost in thought while running along the beach, trying to fix life as it occurs; but that life seems to continually recede, fading away further still in the paper copy. 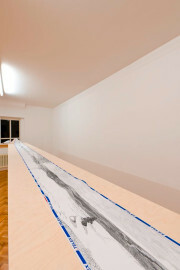 In her drawing, Maria Bussmann deploys various forms of coding: her technique involves the use of lines, hatching, dots and squiggles, as well as reflections on the two- and three-dimensionality of the scenes portrayed. 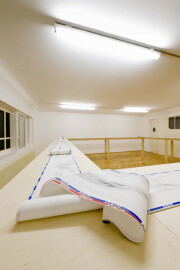 The beginning of the 20-metre work extends beyond the edge of the table. The telex paper, a largely forgotten medium, whose use further underlines the communicative character of drawing, is presented on a high table: the waves made by the thin paper offer insights, the corners create interference and irritation. The drawing’s content is reduced to a deserted beach, to water and sand, punctuated only by a few common beach objects and elements of infrastructure that testify to the cultivation of the place. 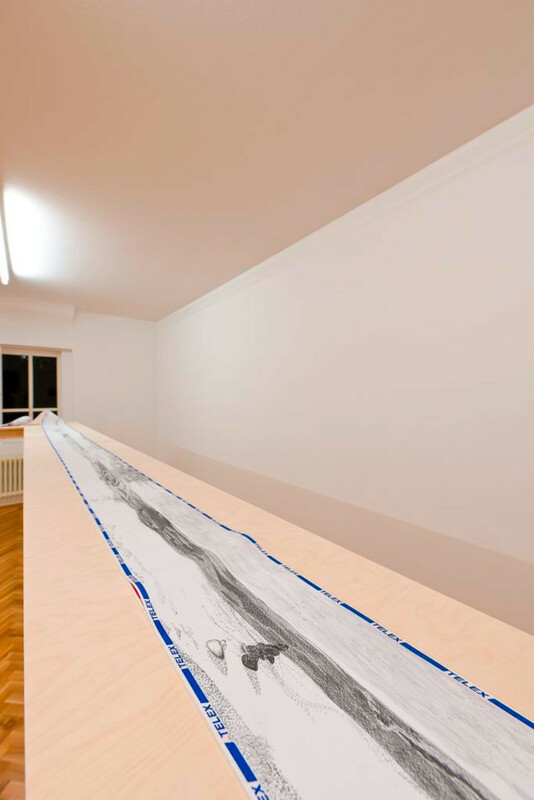 At the same time, viewers walk along the beach and along the drawing—they can advance and retrace their steps, they can compare and contrast, they can perceive and differentiate until they come to the “end” that disappears into the remaining roll of paper, remaining both closed and open in equal measure. 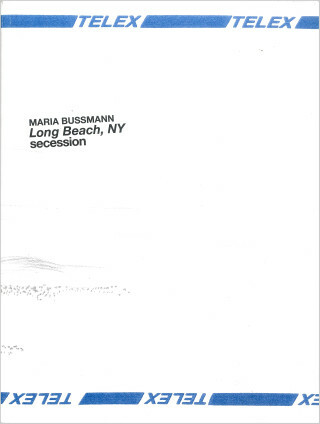 Maria Bussmann, born in Würzburg (Germany) in 1966, lives and works in Vienna and New York City.